Among the large bodies of work in the classical music repertoire, Franz Schubert's output of songs or lieder stand out not only by virtue its scale – some 729 songs, written before the composer’s death at age 31 – but also by its quality. Sure, there are some songs that aren’t masterpieces, notably from his teenage years, but the majority of these are powerful combinations of words and music. Schubert is, more or less, the father of the lieder genre and his songs are performed regularly around the world. His late song-cycle Wintereisse is one of the masterpieces of Romantic music and the most impressive example of the genre. Hyperion Records made the first recording of all the songs, beginning with an idea by accompanist Graham Johnson, and continued as a labour of love — and a relative commercial success — for 18 years. Hyperion managed to bring together many of the great lieder singers of the time, even providing showcases for young singers who would go on to become essential performers in the genre. From “classic” singers such as Ann Murray, Janet Baker and Peter Schreier, to new finds like Ian Bostridge and Matthias Goerne, this set is full of great voices. Even the grandfather of Schubert lieder, Dietrich Fischer-Dieskau, makes a cameo appearance, reading some poems that are part of the cycle Die Schöne Müllerin, by Wilhelm Müller, which Schubert did not set to music. One of the features of the Hyoerion cycle was the extensive liner-notes by Graham Johnson. As they stood in booklet form, they were a veritable encyclopedia of Schubert’s lieder, but now, in book form, they take their place as one of the monuments of writings about music. 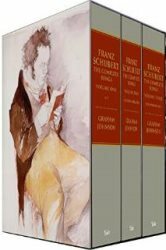 Published by Yale University Press, Franz Schubert: The Complete Songs is a 3-volume, 3,000 page set, and is finally available, after many delays. At $300, or £200, it’s a big investment, but it’s quite an astounding set. There are also entries about poets, composers, Schubert’s friends and family, articles about musical elements (such as tempo and ornamentation), and, at the end of the third volume, there is a Schubert Song Calendar, a 50-page overview of the songs in chronological order. There are indices of the songs and of the recordings in the Hyperion edition, and much more. I’m one of those people who likes to understand music. Having read many of Johnson’s notes to the Hyperion recordings, and wanting more, this set is going to help me dig more deeply into Schubert’s lieder. I may go through the songs chronologically, which is the order that Hyperion follows in their budget edition of the songs or I may just dip in and out of the books as I listen to different recordings of other lieder singers, such as my favourite, Dietrich Fischer-Dieskau, and others. Fischer-Dieskau recorded 463 of the songs, now available in a budget box set. I know I’ll be spending a lot of time with these books, as I discover more about the wonderful body of work that is Schubert’s lieder as I read Graham Johnson’s encyclopedic notes while listening to the dozens of recordings in my collection.